A striking meditation on our own Mortality and the pressing need for constructive and careful living. 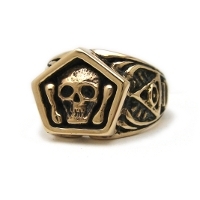 In total, surmounted by a pentagonal casket holding a skull and bones. 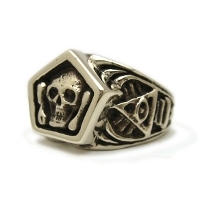 We hope this ring will be a tasteful and considerate statement of the symbols of the third degree. The other side has the divine triangle with the All Seeing Eye of God surrounded by the blazing glory. Just underneath this are the three steps of Free Masonry and a Setting Maul. 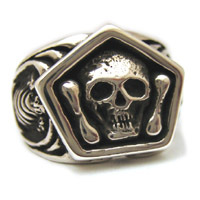 This ring is also available with a square and compass crest inside the casket instead of the skull, at the menu to the left. Currently 34 guest(s) and 0 member(s) online.